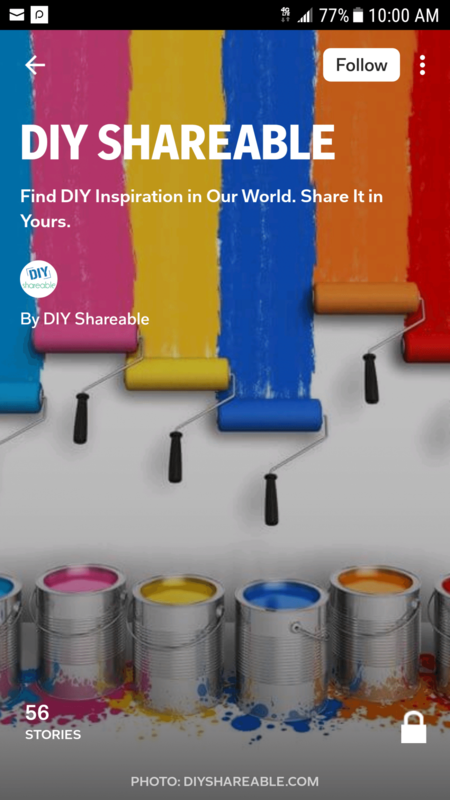 DIY Shareable - Find DIY Inspiration in Our World. Share It in Yours. Learn how to make DIY rain chains & replace those unsightly rain gutters.This homemade water feature can add curb appeal and helps to protect your home. Why is it that most home decor items can’t be both functional AND stylish? Shouldn’t someone have figured this out by now? Is there a solid reason why air conditioning units, pool equipment, and other operational equipment for your home are so, uh……ugly? One thing that a house really needs – but can be such an eyesore – is gutter downspouts! Your cute front porch deserves something better than a generic piece of metal to direct the rain away! What can you do though? The Japanese have long used attractive and stylish rain chains to incorporate function and style into their home needs. These buckets can be chosen to match the colors of your home. Be stylish and eco-conscious at the same time. Place a rain barrel under the rain chain and use the collected water in your vegetable garden or in your potted plants! Look at you now – DIYing and saving the world – one project at a time! Note: Be careful when dealing with these tools and materials. This is definitely an adults only project! Using a hammer and a nail, punch a hole through the bottom of each tin can. You may want to use safety glasses and gloves in case of any sharp or flying metal. Remove the nail after punching the hole in the tin cup. The hole is where you will be slipping the wires as you connect the chains between cans. Break the chains into shorter segments. Each segment should have the same number of links. Measure the distance you need the rain chain to cover and determine the segments needed based on the length measured. Cut about 2 inches of wire. Using the end of the pliers, bend the wire on one end to make a loop. Before closing the loop, slip the wire through one end of a chain segment. Pull the other end of the wire through the hole you made on the can. Make a loop at the other end, attaching another chain segment to the wire before closing the loop. You should have something that looks like this. You can either connect a can at the the top or bottom end of this link. Cut another 2-inch wire make a loop around the last link of the lower chain segment and close it like you did earlier. Continuing repeating steps 6 to steps 8 until you eventually get something pretty similar to this. When you have one can left, cut another 2-inch wire making a loop around the last link of the lower chain segment and close it like you did earlier. Pull that wire through the hole of your last can and make a loop at the bottom to secure the can in place. Thread wire about 1 foot in length through the very first link at the top of your rain chain. Use that wire to hang it from a sturdy bar, pole, or whatever you have in your yard. These rain chains are a great and attractive alternative to unsightly gutters in those areas where you need a little curb appeal. Remember to place a few in sight of some windows so you can watch them fill and empty during a rainstorm. It’s a soothing and relaxing way to enjoy the inevitable summer downpours. Once you get the hang of making these, don’t forget that they can also make perfect gifts. Choose the gardeners or style savvy people in your life, coordinating buckets and give them a gift that is both practical and pretty! 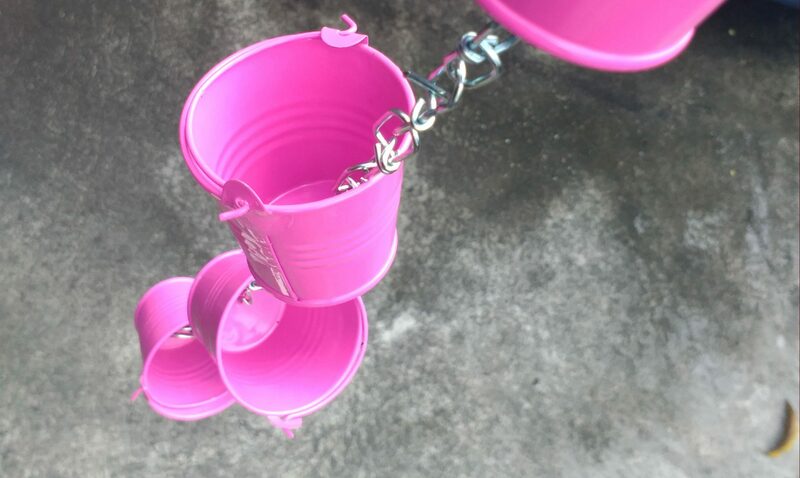 Thank goodness for all the great things Japan has brought us – smartphones, sushi, and now beautiful rain chains for the garden and yard! Do You Flip Out Over DIY Projects? Literally Flip through our Digital Magazine Version using your mobile device & get inspired on the go. Amazon Affiliate Disclaimer: DIYShareable.com is a participant in the Amazon Services LLC Associates Program, an affiliate advertising program designed to provide a means for sites to earn advertising fees by advertising and linking to amazon.com. © 2019 - DIY Shareable. All Rights Reserved. Do You Flip Out Over DIY Projects? Literally flip through our Digital Magazine using your mobile device and get inspired on the go. We hate spam too. Your email will NEVER be shared.